A monument of fantastic literature to stand beside such classics as Dune and The Lord of the Rings, Lyonesse evokes the Elder Isles, a land of pre-Arthurian myth now lost beneath the Atlantic, where powerful sorcerers, aloof faeries, stalwart champions, and nobles eccentric, magnanimous, and cruel pursue intrigue among their separate worlds. In this first book of the trilogy, Suldrun’s Garden, Prince Aillas of Troicinet is betrayed on his first diplomatic voyage and cast into the sea. 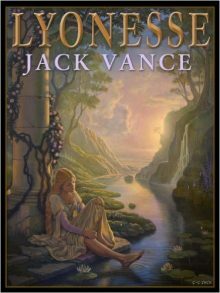 Before he redeems his birthright, he must pass the breadth of Hybras Isle as prisoner, vagabond, and slave, an acquaintance of faeries, wizards, and errant knights, and lover to a sad and beautiful girl whose fate sets his undying hatred for her tyrannical father–Casmir, King of Lyonesse.